These machines are of the highest quality and use state of the art technology enabling us to make the process semi or full automated. The quality these machines produce has led to fantastic reports from our clients and forced us to expand the business. We quote a price for your part / product to be programmed into our machine and samples produced. This enables you to see the quality also the cycle times. On approval of samples we quote you a price for us producing the product on our lathes. We quote a price for supplying a fully auto lathe that can produce your parts.Auto lathes can be programmed to perform the work of highly skilled craftsmen, which is especially advantageous when manufacturing with high yields, as it allows for consistency and repeatability of quality whilst decreasing labour costs. The thermographically controlled lathes manufactured by Moores Equipment are high technology production machines which are fully automated producing a wide range of glass and quartz products by hot forming operations. From tubes or rods, these machines can shape by using any combination of forming, pushing, pulling, blowing, sealing, collapsing or centrifugal operations, providing a very high dimensional accuracy. Thanks to a teaching system, programming of the equipment is quick, simple and user-friendly. Another advantage is the flexibility. As no mechanical setup is required, only a few minutes are required to switch from a production to another, making this equipment cost efficient, even for small production batches. It is available in various sizes and includes a set of accessories to fit the widest range of applications. Auto lathes can be programmed to perform the work of highly skilled craftsmen, which is especially advantageous when manufacturing with high yields, as it allows for consistency and repeatability of quality whilst decreasing labour costs. 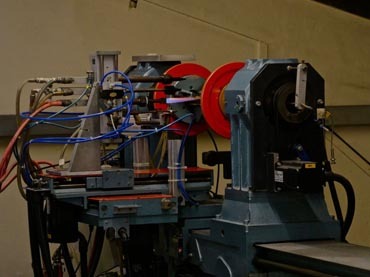 These thermographically controlled lathes are fully automated to produce a wide variety of glass and quartz products by hot-forming operations. From tubes or rods, these machines can shape using any combination of forming, pushing, pulling, blowing, sealing, collapsing or centrifugal operations, providing high-dimensional accuracy. Programming the equipment is quick, simple and user-friendly, and the systems are flexible. Since no mechanical setup is required, it takes just a few minutes to switch from one production to another, making the equipment cost-efficient even for small production batches. Remote control. 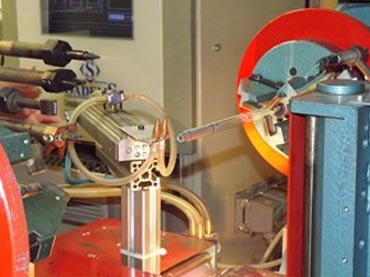 Using joysticks, potentiometers and other controls, a glassblower can produce a reference piece on an automatic machine. During this operation, called acquisition, the machine records all actions made by the glassblower, as well as thermographic and dimensional maps. The software analyses all the information recorded during the acquisition, finds correlations between the actions made by the glassblower and the thermographic and dimensional information then automatically generates a production programme. Corrections can be made directly in the program to improve the quality or the production specials. As a glassblower works on a manual lathe, he is working in closed loop. He carries out an operation, looks at the effect of this operation on the glass and consequently decides about his next action. The effect analyzed can be linked to the viscosity of the glass or its shape. 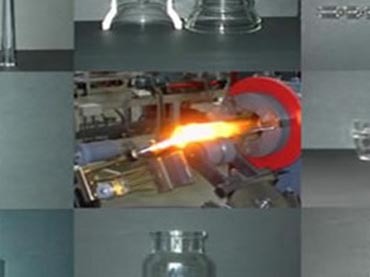 This method allows the glassblower to adapt to variations in his working environment (dimensions of tubing, flame power) to produce the same final result from various working conditions. These thermographically controlled lathes are roughly working on the same principle. The embedded thermographic camera continuously measures the temperature profile and the dimensions of the working glass at locations defined by the program and adapt the programmed actions according to the result of these measurements. Taking into account the machine is able to perform these measurements with a far greater accuracy than a glass blower, the final result is also more accurate and repetitive, with tolerances up to ±0.05 millimeter. Another impressive characteristic of these equipment’s is the time required to switch from a production to another one. Indeed, the machine is designed so that no mechanical setup or manual setup is required during a change-over. The tasks are limited to the change of burner heads, forming tools and possibly the blowing connections. Then, the programme is selected in the library. In practice, no more than 10 to 15 minutes is required to change over production, making these equipment’s flexible and cost-efficient even for small productions. Although the hardware includes an axes controller and an CAN bus I/O terminal, the user interface has been concentrated in a single software running under Windows XP making the use of the equipment simple and user-friendly. The software manages all low-level interfaces, leaving the user with a well know Windows interface. No specific knowledge is required to use this machine in production, unless the knowledge of Windows environment and the Moores Equipment training session. Also, all applications share the same common architecture, making programmes easy to read and modify.